I'm linking up today for Marionberry Style's Animal Print Trend of the Month link-up! I didn't realize just how much animal print I had in my closet until today. I guess this skirt qualifies as zebra? I've got some snake going on on the shoes, and a "tooth" on my necklace, too. I had today off from work for the Jewish holiday and I really did nothing special except get my oil changed. It should have been a quick thing but somehow it turned into a 3 hour ordeal! This is why it took me a year in between my last oil change, lol, I just have no patience to sit around at a car shop. My car is probably the area in my life that I am the least responsible. Do you follow the rules when it comes to your car and taking care of it? To change the subject - I love this top from Old Navy! It is very soft and comfortable to wear. Plus it is VERY easy to iron! I hateeee wearing button up shirts and really never wear them because I find them constricting, but this top is A-OK in my book, I highly recommend it. I love the skirt with that blazer. Such a great combo together. And I believe you have three different animal prints going on with the clutch. I think you should win an award because that's amazing and it all looks fabulous together! This outfit is so great! I always hesitate to wear a blazer with skirt because I'm worried it'll look too suit-like, but this is the perfect balance in my mind!! Your accessories are incredible, too! You look gorgeous! I have the same exact shirt in three colors! Blue, Orange, and that White. 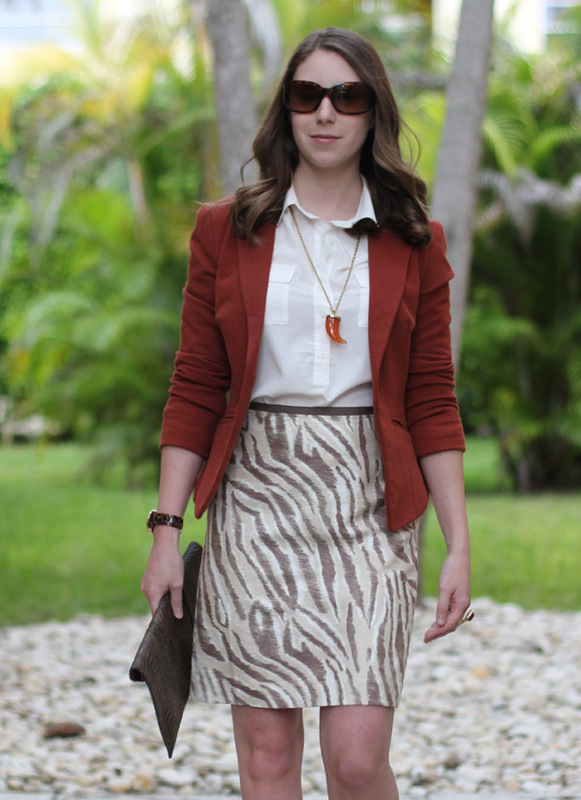 That skirt is gorgeous - it's such a subtle animal print, and the blazer makes the whole ensemble perfect for fall. LOVE!